I went out for bagels last Sunday, and I took with me my D40 and my 180mm f/2.8 P. I took a few shots, mostly nothing particularly interesting, but a couple I liked — both shots of odd numbers of shoes left unattended. I always enjoy finding and photographing unusual abandoned objects — not trash, per se, but things that appear to be dropped or set aside in the prime of life — clothing — underwear is always particularly curious, found on sidewalks –, unfinished meals, and whatnot. 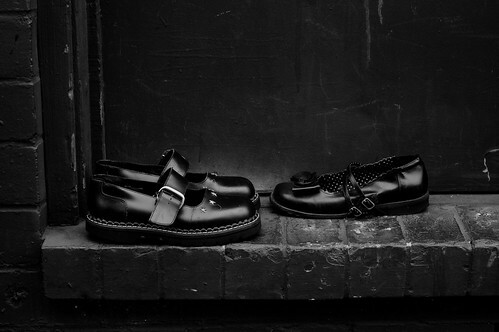 The Sunday shoes were all black leather, and they both seemed to work best as black and white conversions. For the one above, I used a strong magenta filter setting in Capture NX (the wall was a thick, dark red), for the one on the right, I think I used blue. The 180mm f/2.8 P is one of my favorite lenses, especially for these subjects. It’s much easier to get usable perspectives without kneeling or just outright laying on the ground, and it’s great for picking the interesting details out of a scene. It is a bit bulky, of course, but it’s about as easy to hold steady as my 55-200VR — the heft makes up for the lack of fancy techno-stabilization.